Age 98 of Owosso passed away Thursday, October 25, 2018 at the Villa at Green Lake Estates. A Mass of Christian Burial will be held 10am, Monday, October 29, 2018 at St. Joseph Catholic Church with Fr. Dieudonne Ntakarutimana officiating. Burial will follow at St. Paul Cemetery. The family will receive friends at Nelson-House Funeral Homes, Owosso Chapel on Sunday from 2pm to 6pm with a rosary prayed at 5pm. Ann was born April 28, 1920 in Ovid, the daughter of Joseph and Barbara (Zruna) Marek. She was an active member of St. Joseph Catholic Church in Owosso. Ann enjoyed making kolache's and crocheting. She married August Kovacic on October 22, 1938; he predeceased her on September 25, 1997. 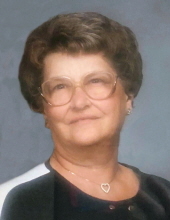 Ann was a homemaker that raised six children. She will be remembered as a loving mother, grandmother and great-grandmother. Ann is survived by her children Joanne Smith of St. Johns, August (Shirley) Kovacic of Linden, Janet (Chuck) Smith of Durand, Alan Kovacic of White Lake, Arthur (Kim) Kovacic of Tustin; 15 grandchildren; 16 great-grandchildren; many nieces, nephews and other loving family members and friends. She was predeceased by her husband August and daughter Jeannie Kovacic. Memorial contributions are suggested to St. Joseph Catholic Church. To send flowers or a remembrance gift to the family of Ann B. Kovacic, please visit our Tribute Store. "Email Address" would like to share the life celebration of Ann B. Kovacic. Click on the "link" to go to share a favorite memory or leave a condolence message for the family.